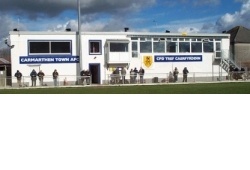 The Club was formed in 1948 and currently plays in the Welsh Premier League, the highest level attainable to the Club. The Community Centre was opened in 2009. Eminently suitable for any function you have in mind. Fully air conditioned, tastefully decorated. Well furnished - to seat 150 in extreme comfort. Suitable for junior disco and other events. In House Caterers providing excellent value meals including Sunday lunches. During day light hours the Centre is easily accessible from St Peters Car Park via Richmond Park (100 yards along concrete paths). Also parking for 25 cars within Richmond Park itself, accessible from St Peters Car Park. Priory Street Car Park is adjacent to the Centre. On leaving the station cross Old Carmarthen Bridge in the direction of Carmarthen town. At the traffic lights cross and follow the road to your right up Castle Hill past County Hall and along Spilman St. The Clubhouse is situated 200 m past church along Priory Street and through the Priory St. Car Park. Approx.1 mile from Station / 10-15 min walk. At the large roundabout on the outskirts of town take 3rd. exit sign posted Town Centre. At next roundabout take first exit left and continue to next roundabout and then right towards Town Centre. On old Carmarthen Bridge follow directions as above. Follow through signs for Cardigan / Lampeter and Llandeilo / Brecon. From the Old Bridge and Castle Hill directions as above. From E & N A484 & A485 (Lampeter) A40 (Llandeilo, Brecon). At the roundabout on the outskirts of Carmarthen at Abergwili take the bypass (sign posted through traffic). At the next large roundabout (1 mile) take right and follow signs for the Hospital (H A+E) and Steam Railway. Take a left at the next roundabout and continue past hospital to mini roundabout. Take left for the centre of town. Continue across large roundabout and in 1 mile mini roundabout into Priory St. Community Centre on right in about 200m. From bus station continue through pedestrianised area in the direction of St. Peter's Church. Continue into Priory St. For approx. 200m. The community centre is situated on left through the Priory St. Car Park. Approx 10 min walk.